Convenient Locations All Over Richmond! 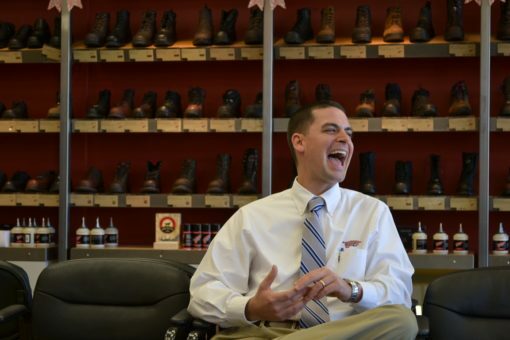 When you’re looking for Red Wing work boots and shoes in the Richmond, VA area, you have three different Red Wing Shoes Richmond locations to choose from! We have stores in Midlothian, Brook Rd, and in Chester, VA. Each location boasts a wide selection of Red Wing work boots, quality work accessories, as well as a highly-trained staff that is happy to help you find the perfect boot for your needs. We also have a location in Charlottesville! If getting to one of our stores isn’t an option, we have a mobile store that can come to your work location to enable all of your employees to get the best work boots available to protect their feet, knees, and ankles. Need some more info about our 3 locations, or just need directions? Let us know! We’re always happy to help out in any way that we can. Send us a message on Facebook, contact Red Wing Richmond online, or just give us a ring! We hope to see you at our Chester, Midlothian, or Richmond location soon!